We successfully created high-quality plastic ASKA3D-Plate products (20-centimeter squares) which significantly reduce costs and are suitable for mass production. We decided to exhibit samples at CEATEC JAPAN 2017 (Combined Exhibition of Advanced Technologies). 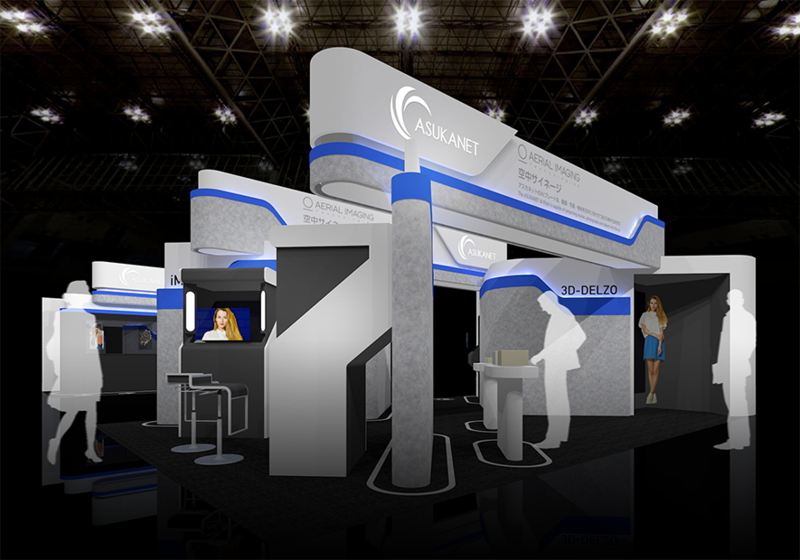 Asukanet Co., Ltd. (head office: Hiroshima-shi, Hiroshima, President, CEO & Representative Director: Yukio Fukuda) (hereinafter called "Asukanet") is pleased to announce that we have successfully completed prototype plastic ASKA3D-Plate products manufactured by a new production method for mass production after our long-term efforts for development. We are going to display the prototype at CEATEC JAPAN 2017. 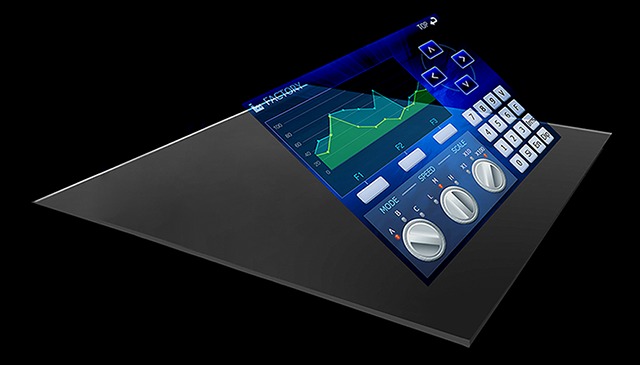 We are also going to announce the details of the event display which utilizes our ASKA3D-Plate. We have successfully developed prototype plastic ASKA3D-Plate products using a new production method which enables mass production and cost reduction after our long-term efforts. This new production method, in which plastic is molded into a special shape and vapor deposition is carried out on the wall surface, simplifies the production process and is suitable for mass production. We are going to display our plastic ASKA3D-Plate products manufactured by the new production method at CEATEC to show the quality of the products as well as to provide samples and receive inquiries for quotations upon request. The plates to be displayed are our initial products. Please note that the plates may be enhanced due to further quality improvement. The image resolution and contrast are significantly improved with AR (anti-reflection) treatment applied to conventional glass plates. This system projects three-dimensional real-size images of people and large-scale objects in midair, and allows both the images projected in midair and the observer to have a visual contact and communicate with each other through holographic images. Of course, no transparent screen is necessary, and you don't have to wear any devices such as a headset. You can expect that this system will catch the eye of passersby and serve as a new communication advertisement method when used as signage at an event. In conventional chat systems, you may feel uncomfortable trying to adjust the eye level to the other person due to deviations in the camera position. iMATCH, combined with the ASKA3D-Plate, camera, and motion sensor, provides you with a natural conversation experience in which you feel as if your finger touches the finger of the other person through holographic images, realizing an unprecedented new communication interface. We will reproduce an interactive air hockey game in this exhibition. This system is capable of creating and transferring computer-generated images of an object to a remote location. 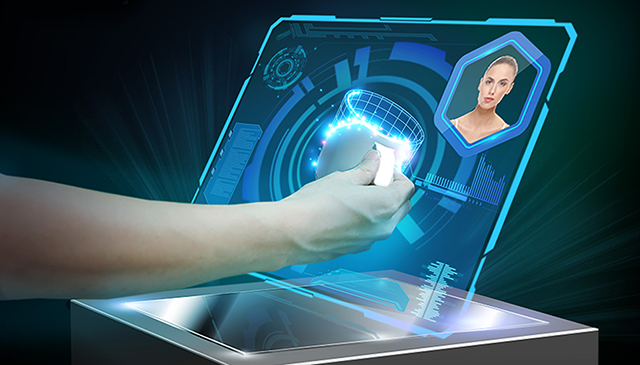 When an object is inserted in the holographic display of the sender, the artificial intelligence creates computer-generated images of the object to transfer them to the receiver. 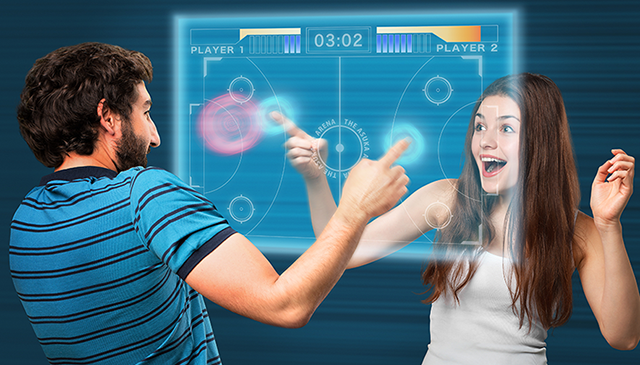 You can share the transferred images in midair, and video chat while controlling the images with gestures. The size, shape, and color of any object can be transferred to a remote location in real time, allowing you to immediately share information on medical or academic research and prototype samples of new products. 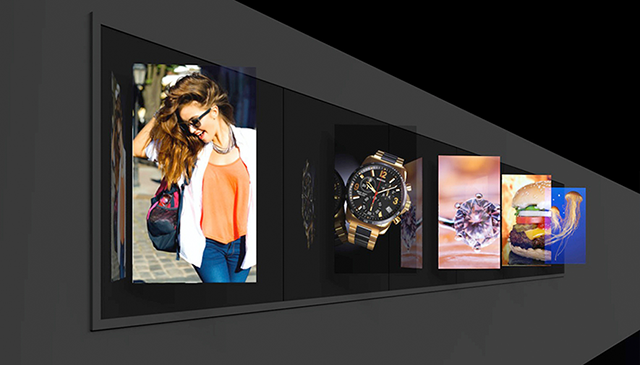 Images that pop-up from the wall to midair will certainly catch the eye of the passersby and make them stop. Holographic images and videos appear in midair by means of 5 screens in a row, each of which consists of six 1-meter square ASKA3D-Plates. Those images are also visible from a distance, drawing attention of people in a wide area. They create eye-catching spaces for shops, bringing about unprecedented effects. This exhibition ushers in a new data-driven industrial revolution and brings together goods, services, and technologies for a coming information-oriented society. It also offers new business opportunities, facilitates the exchange of state-of-the-art technologies and information, and proposes solutions to social challenges in order to contribute to further development of industry and improvement of lifestyle and society. This exhibition consists of four areas including the "community area", "home & lifestyle area", "devices & software area", and "themed area." Free if you register your visit in advance on the exhibition website (http://www.ceatec.com/en/).